New version 5.3.0 of Bopup Communication Server is available for download. This is major release of the server product that added support for multiple ranges of IP addresses that can be now associated with each messaging group. Previous versions of the communication server supported only a single IP range that could be used to dynamically add users to the group. In some cases that was not enough if a customer has large and complicated network with different ranges of IP addresses. Now that question can be easily solved. 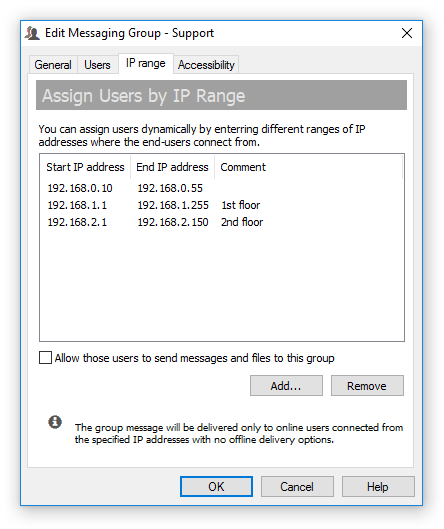 The "IP range" tab of the group properties dialog contains a list of associated IP ranges. Click Add... button to add a new range of addresses including a short comment string. 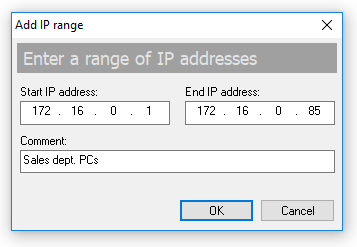 To remove an existing IP range click Remove button. All dynamically assigned users get an instant notification once they have been added or removed from a group. The new version of the IM server also fixed a user display option that shows user names in the server console in a choosen format. It worked wrong regardless the selected format.